We use lasers for many different procedures to make treatment more efficient and comfortable. Our office is proud to boast of having the most lasers (nine) in San Diego County to best treat any patient. Our dentists are especially knowledgeable in lasers and laser dentistry. In a nutshell, Laser Dentistry incorporates lasers into dental procedures to provide more efficient and comfortable treatment. With lasers less anesthesia is needed, bleeding is minimized, swelling is controlled and there is usually little, if any, postoperative discomfort. Lasers have been in use for 20 years and are a completely safe alternative to the scalpel or drill. You pop safety glasses on, and as the laser doesn’t make any whining sounds or other annoying noises, you can just sit back and relax! A laser is an instrument that produces a very narrow, intense beam of light energy which may or may not be visible to the human eye. When laser light comes in contact with tissue, it causes a reaction. The beam of light produced by the laser has the ability to remove or shape soft tissues (gums) or hard tissues (removal of decay). Dental lasers are a family of instruments. Some are used for surgery, some to enhance whitening and others to remove tooth structure for elimination of disease or to restore a tooth. Lasers are generally divided into soft-tissue and hard-tissue lasers. Lasers can be used to reverse gum damage and regenerate lost support, doing so in the most comfortable manner possible. In many cases, patients who thought their only option was painful gum surgery have been amazed by laser assisted surgical gum treatments. • No-injection, no-anesthesia, no-drill fillings! Lasers can also be used to remove decay in a comfortable, minimally invasive way. Special lasers are used without numbing or using anesthesia to do a filling when the cavity is a safe distance from the nerve. Less tooth needs to be removed as the laser is calibrated to remove only the decay. This is a big hit with the kids, as well as the adult patients who are fearful or experience “dread” of the dental drill. Another plus is the laser prepares your teeth in such a way that your tooth-colored fillings last longer. There is none of the noise or vibration that a dental drill produces. Due to the laser’s precise nature, there is also little swelling, no bleeding (the laser seals the blood vessels and nerve endings) and little to no post-operative discomfort. Many dental procedures can be performed without anesthesia due to the precision of the laser. The laser’s pinpoint accuracy is precise enough that we can leave in place as much healthy tooth structure as possible, allowing you to keep your own teeth longer. A scalpel is less precise and as a result causes post-operative discomfort. 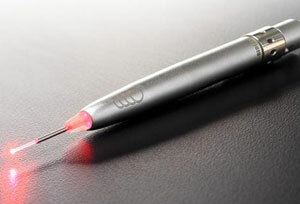 As with any cutting, the scalpel causes bleeding and swelling, this is eliminated by the laser which seals the blood vessels and nerve endings as it performs its job. Lasers are also used to modify gums and other soft tissue. 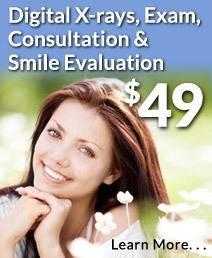 We can painlessly improve smiles with the newer, more advanced “Gum Lift”. 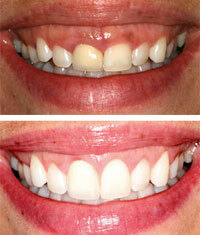 Gummy Smiles can be treated painlessly and the improvements to your appearance are amazing. Lasers are also used during orthodontic (teeth straightening) treatment to control gum swelling and improve the shape of the gums following braces. Sometimes, over the months and years of wearing braces, gums become unattractively thick, bulbous and poorly shaped. It has been said that a smile is like a painting. The teeth are the painting, the gums are the frame. Take a look at some of your favorite actors or actresses in the magazines and notice how perfect the gums frame their beautiful smiles. Using dental lasers, you can have this kind of beautiful smile by shaping your gums. Many in-office whitening systems use lasers for teeth whitening. A bleaching agent is applied to the tooth and the laser energy enhances and speeds up the bleaching process. Dental lasers can dramatically speed up the healing of cold sores and reduce the pain they cause. In some cases the cold sore may not come back. Read about our Cold Sore Treatment. Using our hydrokinetic lasers—lasers that energize water droplets to gently wash away decay—we can make root canals more comfortable and at the same time more thorough and effective. With the laser we stimulate cells to generate bone faster and thus integrate dental implants reliably and faster. A cavitation is a hole in the bone where a tooth has been extracted and the bone has not filled in properly. Inside a cavitation, bacteria flourish and deviant cells multiply. After an extraction, we can use a laser to make sure the socket is completely healed. We are proud to have nine lasers representing all the latest lasers and laser technology available today. Laser is an acronym for Light Amplification by Stimulated Emission of Radiation. Light is measured in wavelengths and different dental lasers are classified by their different wavelengths. Each of our lasers emits light along a set of different wavelengths that has different properties and are used to perform different procedures. The names given the lasers are based on how the laser light is produced. For example, a common laser is the “diode laser”. This is named as such because the laser energy is produced by a diode, which is an electrical device with two terminals. These lasers are used on soft tissue in periodontal treatment, oral biopsies and frenectomies (removal of tissue under the tongue that impedes movement. Soft-tissue lasers cut and seal at the same time and provide good coagulation. They also seal the nerve endings and this is the primary reason most people experience no postoperative pain following the use of a laser. Some of these lasers can also be used to help revitalize gum tissue. Hard tissue lasers are used to cut into bone and teeth with extreme precision. They are often used for preparing teeth for restoration, as in preparing for a filling, and are a substitute for a dental drill. Our lasers perform these procedures by energizing a spray of water droplets that cuts, etches and shapes target tissues without contact, heat, vibration or pressure. Our DIAGNOdent diagnostic laser is used to help identify cavities through the fluorescing of the area of cavity. It is good for early detection of cavities and helps to make minimal dentistry possible. "All of my procedures were quick and painless. I even almost fell asleep in the chair. Not only is this due to the skill of the dentist and technicians, but also the latest technology in the field that Rancho San Diego Dental always seems to get their hands on."